VANCOUVER, BRITISH COLUMBIA--(Marketwired - Jan. 15, 2014) - Forum Uranium Corp. (TSX VENTURE:FDC) ("Forum" or the "Company") is pleased to update shareholders with a year-end review of the Company's activities for 2013 and exploration plans for 2014. Forum holds an extensive portfolio of uranium exploration projects in Canada's Athabasca and Thelon Basins. The Company is well positioned to benefit from improved uranium markets with 5 drill-ready projects that are 100% owned or are partnered with major uranium companies. In 2013, the Company prioritized the advancement to the drill stage of its 100% owned Clearwater Property which is on trend from Fission Uranium's Patterson Lake South (PLS) discovery. Forum is currently preparing its first drill campaign on Clearwater and with $4 million in working capital, the Company remains focused on its goal of making a new high grade uranium discovery in 2014. Forum raised $6.4 million from common and flow-through equity share financings. Successfully advanced its 100% owned Clearwater project, on trend from Fission Uranium's Patterson Lake South (PLS) discovery, to the drill stage. Drilling is scheduled to begin in February. To date, 11 significant drill targets have been identified. Drilled economic grades of uranium mineralization at its Northwest Athabasca Joint Venture (Forum/NexGen, Cameco, AREVA), including a 3 metre intercept grading 1.34% U3O8 at a shallow depth at Zone A, which remains open along strike to the northwest and southeast. Acquired the 1,381 hectare Highrock South Property in the Key Lake Road area, a similar exploration play as Patterson Lake South at the margin of the Athabasca Sandstone on the prolific Wollaston trend in the eastern Athabasca. Strengthened its financial market expertise with the appointment of James A. Hutton to the Company's Advisory Board. Forum's systematic exploration approach generated approximately 11 drill targets to be drilled in February, 2014 on the northernmost part of the claim. A 3,000 metre drill program comprising approximately 12 to 15 holes is planned at a cost of $900,000 (See Figure 1 below). Strongly anomalous lake sediment anomalies that occur in the two southernmost claims will be followed-up with further prospecting and lake radon surveys. The Northwest Athabasca JV hosts the shallow, sandstone-hosted, 1.5 million pound, Maurice Bay uranium deposit* (600,000 tonnes grading 0.6% U3O8 - Source: Saskatchewan Industry and Resources, Miscellaneous Report 2003-7**). Exploration completed in this area in the late 1970's was not conducted deep into the basement. Basement-hosted uranium mineralization such as Cameco's Millennium, Rio Tinto's Roughrider and Fission's Patterson Lake South deposits were later discovered. Forum acquired its interest in the project with a view to exploring this potential in the area of the Maurice Bay deposit and has successfully demonstrated that intensive alteration and significant grades of uranium mineralization occur in the basement. Forum completed a third drill campaign in early 2013, completing a total of 3,449 metres in 17 holes. High grade uranium mineralization was encountered in two zones. A 3 metre intercept grading 1.34% U3O8 at shallow depths was intersected at Zone A and remains open along strike to the northwest and southeast. A broad zone of strong basement alteration was intersected at the Otis West target. Drilling encountered 40 metres of uranium mineralization, including a 24.5m wide zone grading 0.21% U3O8 with higher grade intercepts up to 1.8% U3O8 over 0.5m. The uranium mineralization has been traced for 50m along strike and remains open to the east. Forum and NexGen have increased their joint interest to 64% in the joint venture and further work plans will be determined after consultation with the Company's JV partners. With positive results being encountered on the adjacent NW Athabasca JV property, Forum is re-evaluating its exploration plans along trend of the Maurice Bay deposit. Henday is located on the Midwest trend, host to the Midwest Lake and Roughrider deposits. Rio Tinto presented a $150,000 budget to conduct an airborne magnetic and electromagnetic survey in the summer of 2014. In addition, relogging and sampling of some of the historical drillholes will be completed. Forum has agreed to fund its share of the program. Forum acquired the 1,381 hectare Highrock South Property in the Key Lake Road area, a similar exploration play as Patterson Lake South at the margin of the Athabasca Sandstone on the prolific Wollaston trend in the eastern Athabasca. The same conductive trend that hosts the previously mined Key Lake deposit (196 million pounds grading 2.89% U3O8 Source: Saskatchewan Industry and Resources, Miscellaneous Report 2003-7**) trends on to Forum's Highrock Lake and Highrock Lake South properties. Forum plans to maintain its core property position in the area in search for a shallow, open-pit deposit. Forum is negotiating its commitments with its partners at its strategically located North Thelon project immediately adjacent to AREVA's 133 million pound Kiggavik uranium deposit averaging 0.54% U3O8 (Source: AREVA Resources Canada Inc. Kiggavik Project EIS, Volume 1, Main Document, April 2012 submission to the Nunavut Impact Review Board**). A decision regarding a production certificate for an 8 million pound per year uranium mine is anticipated for the development of Kiggavik in Q1 2015 after AREVA completes its Final Environmental Assessment Submission, expected in September, 2014. The Nunavut Government re-affirmed its Uranium Development Policy during the year. Forum has entered 2014 with 5 drill ready projects, $4 million in working capital, 29 million shares outstanding, and a low market capitalization. It has kept its highly regarded technical team intact during this extremely difficult period in the junior mineral resource industry, and has strengthened its financial capabilities with the appointment of James A. Hutton to the Advisory Board. The Company has benefited from minimal exploration assessment requirements during this period of weak uranium prices, and is positioned to not only maintain its exceptional Athabasca and Thelon property portfolios in 2014, but is now actively seeking property acquisitions to enhance shareholder value and strengthen its uranium base in these two core regions. The Company looks forward to an active year in 2014 beginning with the mobilization of its first drill program at the highly prospective Clearwater Property in February. Richard Mazur, P.Geo., Forum's President and CEO is the Qualified Person that has reviewed and approved the contents of this news release. To view Figure 1, please visit the following link: http://media3.marketwire.com/docs/921888.jpg. 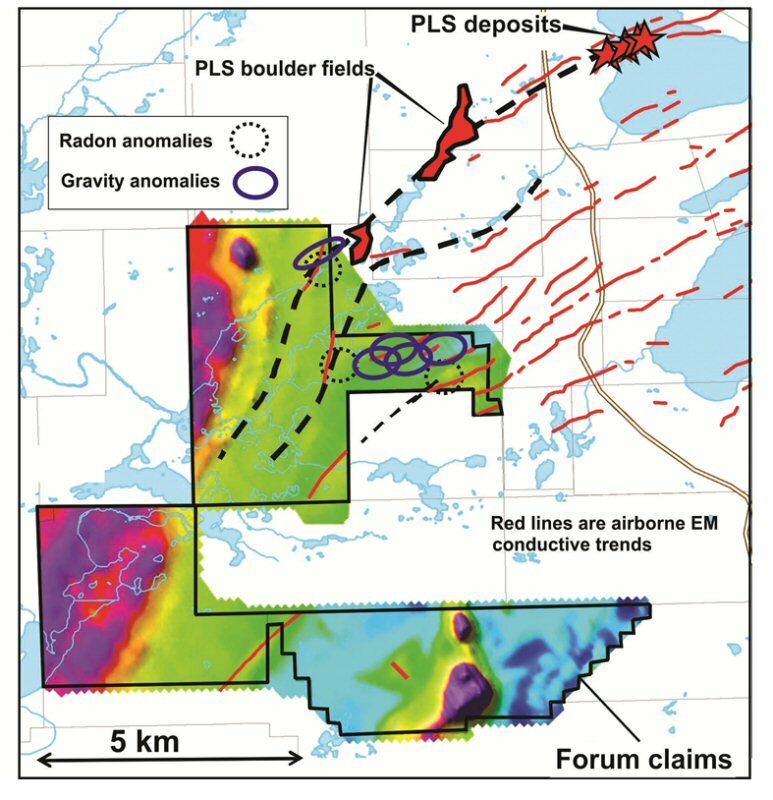 Figure 1: Gravity and radon anomalies with EM conductors on Forum's Clearwater Project. Red lines are airborne EM conductors, black dashed lines are interpreted structural trends. The background colours are from an airborne magnetometer survey. Forum plans to drill the gravity, radon and EM targets in February. * This is a historical estimate that has not been calculated or classified under the specifications of National Instrument 43-101 and should not be relied upon. A qualified person has not done sufficient work to classify the historical resource estimate as current mineral resources or mineral reserves. The Company is not treating the historical estimate as current mineral resources or mineral reserves.